In the "why did nobody think of this sooner?" product development category comes the Knitter's Pride Dreamz from Webs, a large knitting supplies store. 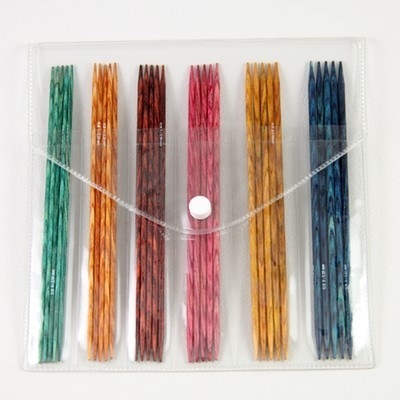 The needles, made of a laminate birch wood, are color-coded by size. This may seem like a small thing to non-knitters, but if you've ever sorted through a set of similar sock needles, the sizes of which can vary by just a few millimeters in diameter, searching for a set of five that match, it's something of a Eureka! moment. Last week, Nest Labs launched a new programmable thermostat. It got a lot of press, not just because it’s expensive and innovative and beautiful, but because Nest Labs was founded by Tony Faddell, who led the iPod team for years, and senior leadership includes other key iPod team members and a MacArthur fellow. I’ve spent a fair amount of time over the last year and a half thinking about programmable thermostats, and how to help homeowners save money by managing their energy use. Some of those thoughts I’m going to have to keep to myself, even though I’m no longer at EnergyHub, but there are a few things not directly related to my work there that I haven’t seen discussed in all of the hullaballoo, and I think one in particular is worth spending some time on. Which is to say, I was really struck by the physical form of the thermostat itself. The company’s video tour highlights one of the cleverest touches - the stainless-steel outer case that allows it to blend more cleaning into the surrounding wall. After all, the whole reason most thermostats are beige is that it’s the lowest common denominator—Nest is solving the same problem more elegantly (though I do wonder about finger smudges…). But I really liked most of all that it’s a circle. I grew up with a boxy beige thermostat with little lever-ish setpoint markers on the top. So to me personally, there’s nothing particularly resonant about the circular form factor. But after spending a lot of time talking to people about home HVAC systems, I know that l’m in the minority on that. The circular thermostat from Honeywell, designed by the great Henry Dreyfuss, is a minor icon of mid-century modernism: it’s just what a lot of people think of when you ask them to visualize a thermostat. The digital thermostat moved away from that shape to mark itself as something new (and also, to be frank, because it needed more space for its components). In time, the rectangular form factor became a marker of technological advance: you had something digital, programmable, and new. The Nest Learning Thermostat takes another technological leap forward: it’s billed as a thermostat that learns its program from your behavior. It’s a thermostat with actual intelligence - possibly a scary thought on a cold night! How do they make it seem friendly and familiar regardless? Return to the circle. After the age of the impossible-to-program digital thermostat, the circle not only says “thermostat,” it says “simple and familiar.” From the manufacturer’s side, having the primary control be the stainless steel ring around the outside cut out the cost of a custom touchscreen component, and gave the design team the opportunity to design controls that (at least in the video) feel almost analog and yet highly precise at the same time. The original iPod’s physical design, on launch, was constantly compared to a deck of cards. It needed to be small, to travel well, and it needed to be iconic, to stand out among the crappy existing options. The white earbuds were a brilliant touch, letting you display to everyone else at the gym or on the train how ahead of the curve you were. At home, though, it’s at least as much about comfort as display. A familiar form, an organic shape, something that’s beautiful up close but blends in at a distance, that’s what makes the Nest thermostat look premium in the home, and it’s almost the exact opposite of what made the iPod look premium in 2001. I still have a lot of questions about the Nest Learning Thermostat, but I’m beyond impressed by how much the people who made it know about making highly desirable consumer objects, and how much they were willing to learn from a classic. I’d like to share with you a maxim I thought of the first time I met an IBM mainframe: NEVER TRUST A COMPUTER YOU CAN’T LIFT! The crowd at the demo goes nuts at this, as they should - it’s a well-phrased snark at the then industry standard. But watching it now, with my iPhone, iPad, iPod, and MacBook all close at hand, it’s a promise of the future. What “never trust a computer you can’t lift” really means is that your computer should fit into your life, not the other way around. The first Mac didn’t just have the infamous handle, it had a carrying case so you could take it to class with you. It had a graphical user interface and a mouse, so you didn’t have to spend years in school, or keep a cheat sheet of key commands on your desk, to get it to add 2+2. It made it easy to make things look good, because people appreciate beauty, and it had an engaging personality. One of my friends kept his Mac Classic alive and running well into the 90s; when another friend walked into his apartment and saw it, she ran up to it and gave it a hug. Steve Jobs didn’t come up with the idea of making the way people think and act the center of the computing experience. But just like he did with the mouse and the graphical user interface, he took an under-appreciated vision and he built the team that made it a standard. There would almost certainly still be a profession like interaction design if there had never been an Apple. But it would have fewer tools, fewer resources, fewer success stories, and it would almost certainly be a lot smaller. I owe Steve Jobs for frog design, and the six years I spent there, but I also owe him so many of my friends who never worked there at all. Particularly as someone who spends a lot of time designing for mobile UIs, I owe Steve Jobs a huge thanks. I love to tell the story of the way the frogNY studio reacted to the original iPhone keynote: there was honest-to-God jumping up and down and screaming. And that wasn’t because we were all giant Apple nerds, although we were - it was because we’d all worked on mobile projects that had gone nowhere. You’d come up with something innovative for a telco, but they couldn’t get the handset manufacturers on board, and vice-versa. None of the ideas behind the iPhone were things I hadn’t seen in concept pieces — what made it extraordinary was that it was finally real. Apple was one of the few companies that could have come in and broken the mobile industry’s logjam, and probably the only one of that handful that would do so thoughtfully and usably. Everything that has happened since to make our telephones into our mobile assistants, smart extensions of our homes and lives, comes in some way from that moment. No wonder people were jumping up and down. Last month I sat with my nephew at his first birthday party and showed him how to scroll through the pictures on my iPhone. He sat transfixed, watching pictures of himself and his sisters go back and forth on the screen. It must have seemed to him, like it still seems to me, like magic. Steve Jobs was no magician, but he gave the designers and engineers he hired a vision, a goal, and a standard to meet. All of us who make things for other people to use are in his debt, and we’ll continue to carry his computers — now even easier to lift. My father’s side of the family is full of artists. In my apartment, I have photos by my father (portraits and otherwise), paintings and illustrations by my cousins, a watercolor by my paternal grandfather, and a vase that a cousin and my aunt made me as a birthday present. I also have drawings by my nieces, one of whom has remarkable drawing skills for a six-year-old, suggesting that the family trait continues. The EnergyHub Home Base, aka the device I spent most of 2010 working on. I’ve had websites I worked on that I could call up from home, of course, but this is the first physical/digital hybrid project that I’ve worked on that is a consumer product - not designed for use in the office or in a commercial environment, but for the home. And now it’s at my home - I’m one of the guinea pigs to whom new releases get pushed out before we spring them on paying customers. The difference between using the device at home and testing it in the office is useful, and humbling - I’ve already caught several things I think we can quickly make better in the setup process. Living with the Home Base, like with every other new smart device I add to my collection, enriches my understanding of what makes something a device you want in your home, and what’s annoying. But I have to also admit that I like having it there because I like having something I can point to, something I’ve added to the family gallery. That it will not last as long as the portrait my cousin did of me aged 18 that still hangs in my living room today is a topic for another time.